When enjoying the beauty of Singapore, you definitely can not miss the beautiful scenery of Marina Bay Waterfront. 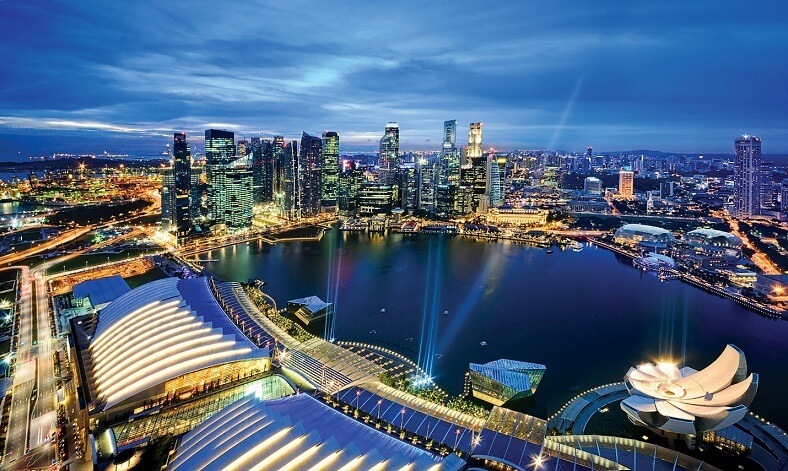 With the rapid development of this city, the entire Marina Bay area has grown and become a modern and dynamic center. The $ 5.5 billion worth Marina Bay Sands complex is at the heart of the bay, surrounded by many great sights. 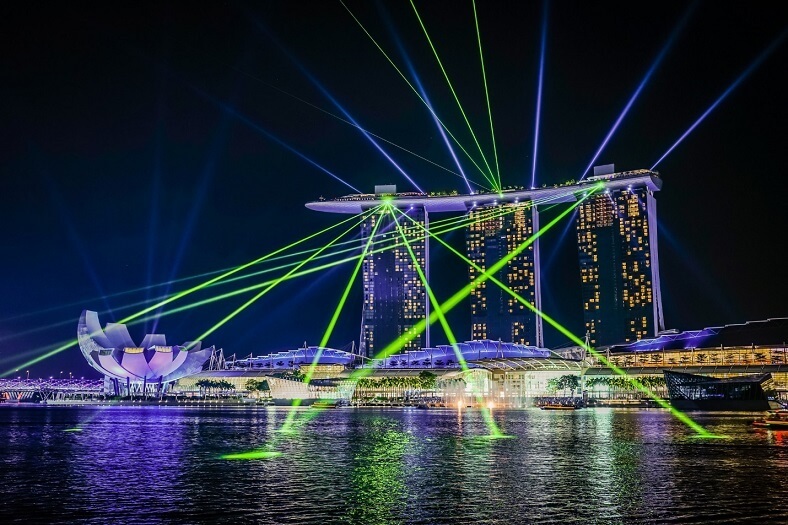 This top 10 most beautiful sights in Marina Bay Waterfront will give you useful suggestion. Marina Bay Sands Skypark is designed in the shape of a yacht on top of three skyscrapers. The park is a 360-degree observation tower with a wooden platform and the capacity of 3900 people.The top of the boat is a perfect place to enjoy the view of Marina Bay at night. Guests can purchase ticket for SGD 23 per adult and SGD 12 per children, taking the elevator to enter the 56th floor of the building in less than 10 seconds for scenic views. 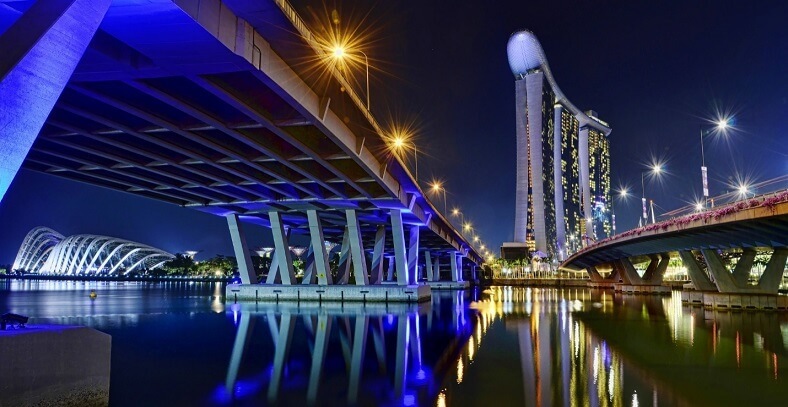 If you can afford – staying in the Marina Bay Sands for one night is a terrific experience, you will be pampered on the yacht basin, and enjoy a refreshing dip in the water. Besides, having meals at two luxury restaurants Sky on 57 and LA VI while watching Singapore is also quite enjoyable. The best time to visit this high-rise park is in the early evening. 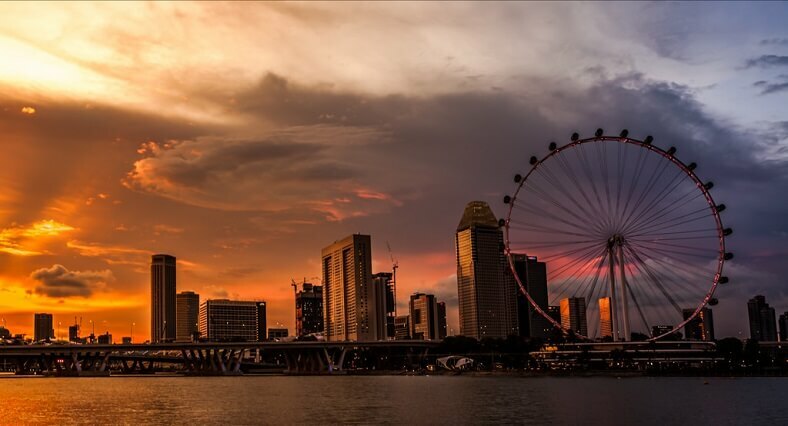 Because this is the time that you can admire the twilight of Marina Bay. Marina Bay Sands Casino is up to 15,000 square meters large- an incredible number. This entertaining venue was built in 2012 and is located in Marina Bay Sands. Inside the Casino, you’ll find over 500 gaming tables with a variety of jackpots and electronic poker screens. Casino at Marina Bay Sands is proud to offer the most updated games as well as the most addictive electronic games in the world. These game consoles have more than different 250 types. As soon as you enter the lobby, you will be attracted by the ceiling lights. It is handcrafted from 130,000 Swarovski crystals and weighs seven stories. Actually, because the admission is free of charge, in reality, not all visitors come here to participate in gambling; somes just simply walk around or try their luck at very small bets. Also, keep in mind that smoking is banned from this place. 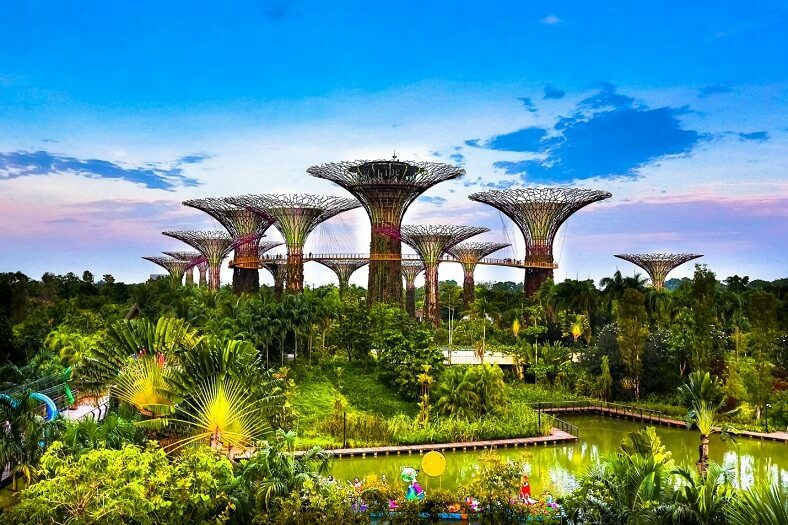 Opened in 2012, Gardens by the Bay, or “Bay Gardens,” is spread over an area of 101 hectares. This place is the second largest botanical garden in Singapore, a famous shooting location not to be missed when traveling to this island. The entire park consists of three gardens: Bay South, Bay East and Bay Central with more than 250,000 species of precious plant. Just 5 minutes walk from the city center, you will be overwhelmed by the giant artificial colorful trees at night, and many rare flowers are brought from many parts of the world. All guests can visit the park for no charge at all. 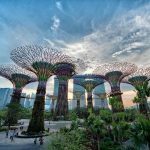 With a glass-roofed dome and a hanging pot with super trees, this architecture gives you a panoramic view of the garden as well as all the way to the Marina Bay Sands. In addition, from the Gulf Coast promenade, you can enjoy the stunning views of Marina Bay Financial District. The ArtScience Museum, designed and built in 2009 and completed in 2011, officially opened at 10:00 on February 17, 2011. With the shape of a lotus flower, the museum consits of 21 exhibits. The museum’s exhibition space is 4,650 square meters. It was designed by famous architect Moshe Safdie and built by Yongnam Engineering and Construction Company. Just a 10-minute walk from both the popular Marina Bay Sands Hotel and the Bayfront MRT Station, the Art Science Museum is a great place for both children and adults. These collections of pictures and artifacts are not only entertaining, but they also contain great educational value through the harmonious combination of science and art. Currently, the exhibition features the largest dinosaur exhibition in Southeast Asia with more than 400 dinosaur fossils, models, and more than 50 dinosaur artworks. 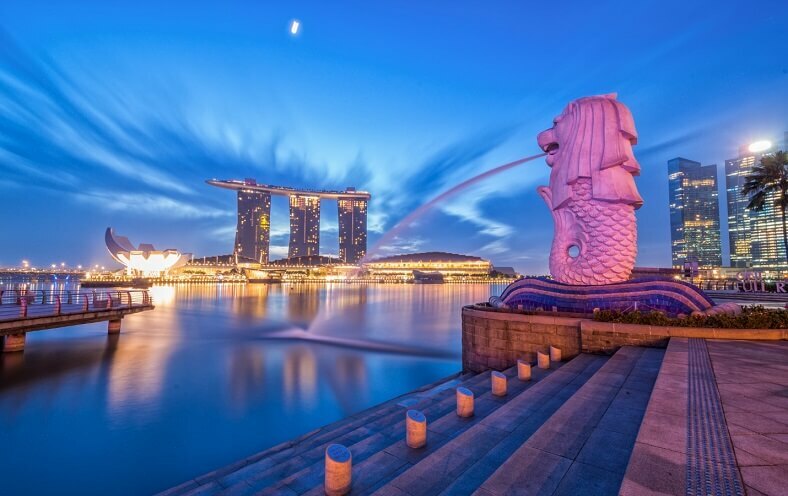 Merlion Park is a scenic location on the edge of Marina Bay, in One Fullerton, near the Central Business District (CBD). The 2,500-square-meter park, perhaps best known for its lion-head statue in its center. The sea lion statue has a height of 8.6 meters and weighs about 70 tons.The figure is molded with Fondue cement, the outer scales are made of porcelain plates, and the eyes are made of two small red teacups. In addition, in the Merlion Sea Lion statue there is also a small statue made of these materials, but 2 meters high, weighs 3 tons and is lined by a large lion statue about 28 meters. Initially, when placed in the Merlion Park, the statue was placed next to the Esplanade Bridge. But when the statue was added to the smaller version, both statues were moved to a new location 120 meters away. 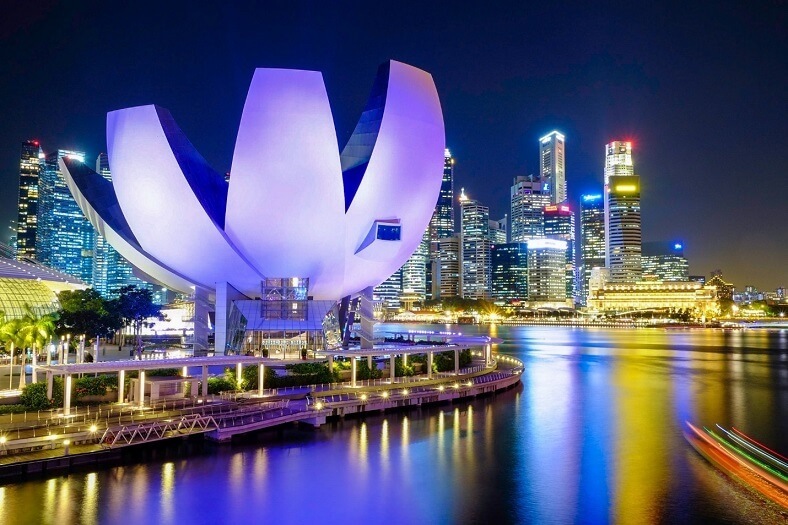 Due to the wide view of the city, this waterfront park has become a tourist attraction that attracts millions of visitors each year when traveling to Singapore. The next attractive architecture in the list of beautiful places in Marina Bay Waterfront is Singapore Flyer. The Singapore Flyer is one of the largest Ferris wheel in the world, built between 2005 and 2008. This recreation is equivalent to a 42-story building (165m). The Singapore Flyer is considered the world’s tallest Ferris Wheel, higher than the Star of Nanchang (China) and the London Eye. From the top of Singapore Flyer, you will be overwhelmed by the magnificent view of Singapore. With 28 air-conditioned cabins, each cabin can accommodate 28 people at a time. In addition, wheelchair users can also use the Singapore Flyer. Since 2007, Singapore has held the Grand Prix Formula 1 racing event – an awaited event for speed-conscious travelers. The race lasts for three nights in September every year, with huge audiences on the stands installed throughout the Marina Bay area. In addition to exciting race, other special events are also held throughout Singapore during this period such as live music performances, fireworks performances. Visiting Singapore this time of the year, you will have a tour “three in one”: satisfying shopping enthusiasts, visiting amusement parks and watching F1 racing. 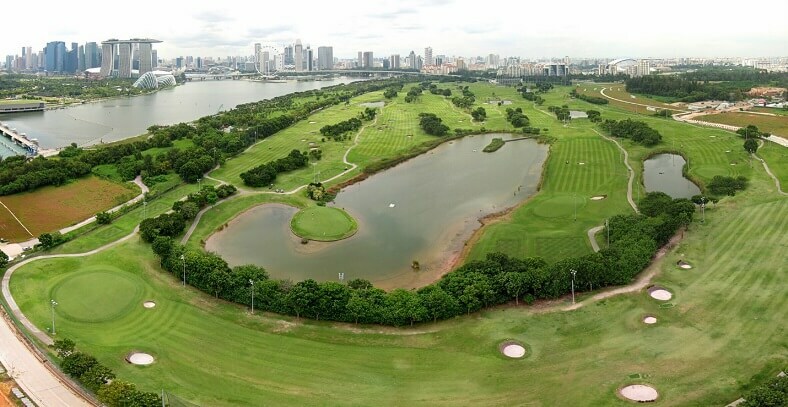 If you want to enjoy a game of golf on the lush green lawns in the middle of the busy commercial center, Marina Bay Golf Course can meet your expectations. This is Singapore’s first and only 18-hole golf course opened to the public. Besides the top quality facilities, the golf course also has beautiful views of the horizon and Marina Bay. Conveniently located in the heart of the city,near many famous hotels, this golf course is very convenient for commuting. You can come here to play some golf with your friends or simply watch the horizon of the magnificent city, day or night. If Sydney is known for the famous Sydney Opera House, the Singaporeans are also very proud of their theater – Esplanade, which features a unique tropical fruit – durian. 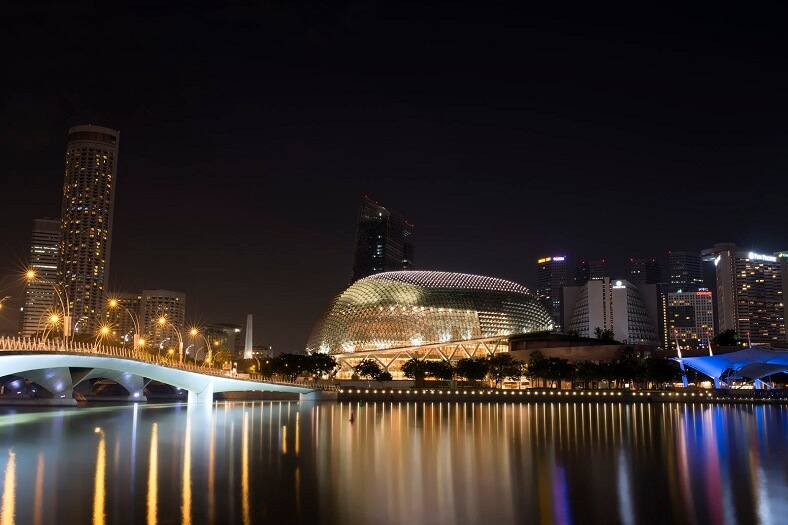 Situated on an area of 6 hectares, on Marina Bay, the Esplanade is a combination of performing arts venues: theaters, concert halls, art galleries, theaters, fashion shows, studios, etc. If you travel to Singapore to find the live performances, the local culture expressed through art, this is a must-visit place. Just one MRT or a short walk from Town Hall you will reach this great theater easily. Science nearby. One day there are two performances at 20h and 21h30, with an extra performance at 23h for three days of the weekend. The 13-minute performance with a variety of light and water-based musical performances will delight visitors. The special feature of this performance is that you can watch from anywhere in the Marina Bay area, completely free of charge. Don’t worry when missing it, because you can watch it the next day. Venue: Can be seen from anywhere in Marina Bay. If you are planning to travel to Singapore, do not miss out on the great Marina Bay Waterfront information along with 10 beautiful sights. Marina Bay Waterfront, this large beachfront complex of the island is always one of the most popular tourist destinations. 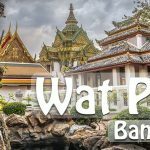 The bay is not only beautiful architecture but also a center of entertainment, fun with a series of interesting destinations. Let’s make an appointment to explore Marina Bay Waterfront for an enjoyable experience.